Direct mail conversions are on the minds of most marketers who use this powerful channel to communicate with current and soon-to-be customers. Even with standard direct mail, Data and Marketing Association statistics show marketers see a 5.1% response rate per household vs. .06% for email—which is the most popular marketing channel, according to Target Marketing’s 2018 Omnichannel Marketing Report. However, paired with an optimization strategy, marketers can greatly increase direct mail response rates. For instance, targeting consumers with Every Door Direct Mail achieves 27% ROI, touts USPS. Whether marketers employ direct mail at the beginning of the customer journey, throughout the customer journey via an omnichannel strategy or at the purchasing stage, they have many ways to increase conversions. There is an overflowing amount of research showing how much marketers value direct mail. For instance, Target Marketing’s “Marketing Mix Trends 2010-2016” results showed 69 percent of respondents either increased or maintained use of direct mail during 2016. The latter quote comes from David Eagleman, a Stanford University neuroscientist profiled in Ricoh research released in January 2018. But there could be other reasons direct mail holds such high status in the marketing mix. It could be the channel’s high quality — images must be high-resolution for print marketing vs. the literal “Web quality” that can be backlit on devices. It could be the fact that consumers can spend as much time as they like gazing at the piece, because the printed word won’t go dark as a device does when it “times out.” But it could also be that print marketing stimulates all of the senses, not just sight and sound. (Think of the smell of a book and the feel of textured paper.) What’s clear is that direct mail is a highly impactful medium when used in omnichannel marketing campaigns. Ricoh also featured findings from Daniel Dejan, the print and creative manager for ETC, the “education, training and consulting” division of worldwide paper manufacturer Sappi, who says consumers learn with all of the senses and print pieces satisfy far more of them than does digital marketing. City of Hope has a loyal customer base—cancer survivors the healthcare marketer treats who are in remission. The nonprofit cancer hospital was using its workhorse fundraising channel, direct mail, to the hilt in 2012. But while putting its workhorse through the paces, City of Hope was only “dabbling” in email. As a result, many former patients were unaware of the possibility of donating to the institution they loved. The healthcare marketer collected emails from those patients, gained opt-ins from e-newsletter subscribers and used more list-building approaches in order to create an email database large enough to segment. This omnichannel approach, complementing direct mail, helped increase the nonprofit's gross revenue per thousand recipients from $69.86 to $246.29, said Diana Keim, AVP of annual giving at City of Hope. "I am a firm believer in the use of telemarketing or email supporting the mail campaign," Keim said. "We've seen nothing but lifts when another channel is used to support the mail campaign." 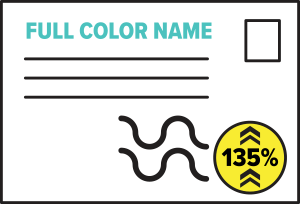 Adding a person’s name and full color in the direct mail can increase response by 135%. Direct mail is more memorable than marketing in other channels and, if done creatively, can enhance that tactile impact. Delta Group—who works with nonprofit organizations to communicate with supporters, advance their missions and influence policy—utilized personalization to cut through the direct mail noise. They utilized digital printing methods to design a new envelope that included a personalized message on the outside as well as the inside. They performed an A/B test and with these changes, they increased their response rate from 1.7% to 2.4%, in comparison to the controlled mailing. Adding a person’s name and full color in the direct mail can increase response by 135%, per Canon Solutions America. Adding a person’s name, full color and more sophisticated database information can increase the response rate by up to 500% vs. not doing any of these things, per Canon Solutions America. Targeting customers on a 1:1 level increases response rates up to 50% or more, per the Data & Marketing Association (DMA). For more “traditional” direct mailers, optimizing the 3D aspect of the marketing channel can work wonders. Healthcare marketer Carestream sent radiology administrators miniature models of its new product, an ultrasound machine, to raise product awareness, interest, consideration and ultimately, purchase as the models stayed on desks during the long customer journey. Oversized direct mail sees 6.6% response rates, which DMA says is the highest household response rate it found. Direct mail is a reliable workhorse, but it can be enhanced to become a thoroughbred. The best approach to take for improving direct mail conversions is to test the sends. Controls can be the tried-and-true Clydesdales, which then race the optimized thoroughbreds. Seabiscuit may be that full-color transpromo insert, bringing in sales from previously discarded online shopping baskets. Anywhere along the customer journey, direct mail is the element of the omnichannel experience that can help marketers win the race.